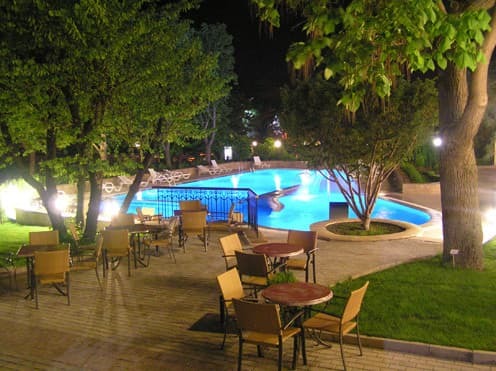 Located on a cozy park amenities, the hotel "Scarlet Sails" ("Alye Parusa") has no analogues in the southeastern region of Crimea. Located in the historic and cultural city center, close to recreation and entertainment, which is important for our guests. The hotel has 54 comfortable rooms with air conditioning, cable TV, minibar, safe, Internet. In the rooms - a spacious balcony or small terrace with wicker furniture. Sundeck on the roof - a natural solarium with stunning views of the Gulf of Feodosia, in the evenings there is an open bar. In the near future will be commissioned Wellness Centre with a pool, gym and fitness room. 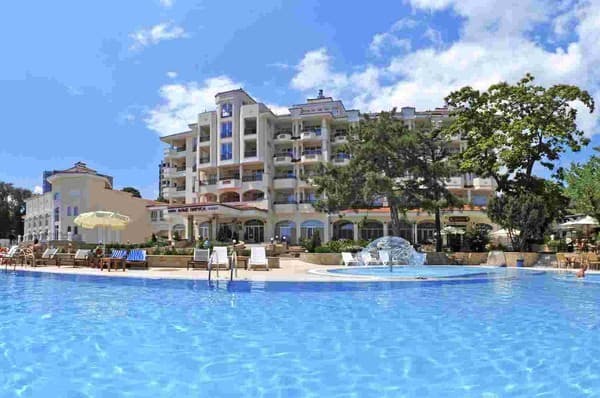 It offers a bath with thermal water, spa-treatments and massages. On the first floor - a stylish gentleman club "TOBACCO & WHISKY", where our guests can spend time playing whist and poker games, chat with friends. Meeting room for 50 people, equipped with modern audio and video equipment, with internet access, provide an opportunity for the organization of seminars, presentations, conferences, and solve business issues without leaving the hotel. Depending on the wishes, we offer suites, rooms, suites (including family), single-and double standards. Welcome to "The Scarlet Sails"! Description of the room: One-room suit which is suitable for one person. In the room: bed (1100 mm), a bedside table, wardrobe, arm-chair, desk, chair, mirror, lamp, air conditioner, mini-bar, telephone, mini-safe, Internet access, carpet. Bathroom unit is for share: toilet, shower, washbasin, hair-dryer, magnifying mirror, toiletries, bathrobe. Entrance from the room to the balcony, equipped with table and two chairs made ​​of rattan. All rooms of this category are with views of the city. Description of the room: Spacious room. When entering the room - a small hallway with coat hook and mirror. The room: two beds, two bedside tables, wardrobe, desk, chair, TV - Plasma (cable television), mirror, lamp, air conditionier, mini-bar, telephone, mini-safe, Internet access, carpet. 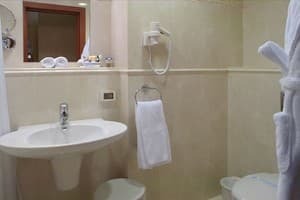 Bathroom unit is for share: toilet, bath, washbasin, hair dryer, magnifying mirror, toiletries, bathrobe. Entrance from the room to the balcony, equipped with table and two chairs made ​​of rattan. View of the sea. Description of the room: Comfortable rooms for 2 people. The room consists of a living room and bedroom. When entering the room - there is a small hallway. In it - luggage rack, mirror, closet. Living room: folding sofa, coffee table, arm-chair, desk, easy chair, TV - Plasma (cable television), light fixtures. Bedroom: double bed, 2 bedside tables, dressing table, easy chair, swinging cabinet, stool. A table with chairs: toilet, bath, washbasin, hair-dryer, magnifying mirror, toiletries, bathrobe. Room is equipped with air conditioner, mini-bar, telephone, mini-safe, Internet access. From the room - exit to balcony. The balconies have two sets of rattan furniture: table and 2 chairs. Description of the room: The room includes two bedrooms and a living room with a group of dining furniture. Equipped with two bathrooms (one of which is for guests), a large dressing room and a hallway. At the entrance - a spacious hall. In the hall there is a goat, a coffee table, a console with a mirror. From the hall - a narrow corridor. In the dressing room: cupboard, ottomans, mirror panel. In the living room: a sofa bed, a coffee table, a fireplace chair, a bar cabinet, a dining table and chairs. In 1 bedroom: a double bed, 2 bedside tables, a banquet table, a coffee table, 2 semi armchairs, an exit to the balcony. In the second bedroom: a double bed, two bedside tables, a dressing table with a mirror and a semi armchair, a banquet, access to the balcony. Balconies overlooking the sea are equipped with a set of rattan furniture: a table and 2 armchairs. Как для Крыма, это хорошая гостиница. Персонал очень радушно нас встретил, предоставляли много разных услуг. По комфортности и чистоте номера претензий никаких нет. В целом гостиница очень понравилась. Единственный отрицательный момент в том, что в душевой кабинке была неисправна дверца, и вылилось на пол много воды. Но несмотря на позднее время, персонал быстро убрал все неудобства. Цены немного считаю немного завышенными. Больше ничего плохого сказать о гостинице не могу. Children under 5 have accomodation free of charge without an extra place. Children from 5 to 12 have to pay for the extra place - 180 Uah (breakfast is included). For adults - 220-300 uah (breakfast is included) depending on the category of the room. 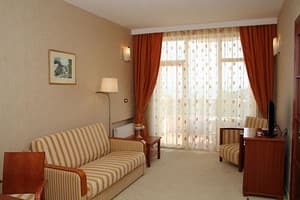 On the avenue Aivazovsky, a stone's throw from the sea, you will find an excellent hotel "Scarlet Sails ". Located in the historic and cultural city center, close to recreation and entertainment. On the basis of the sanatorium, located on the same territory as the hotel. By train to the station. "Aivazovsky" Feodosia, then by shuttle number 2 or 4 to the stop cinema "Ukraine"; by plane to Simferopol, then by bus to Feodosia, then by shuttle number 2 or number 4 to the stop cinema "Ukraine.